One morning, four-year-old Issy Bradley wakes up feeling sick. Her dad is gone being the bishop of their ward in England, and their mom, busy with a birthday party for one of her four children, is preoccupied and doesn't register the seriousness of her daughter's illness, and by the next day, Issy, the baby of the family has been lost to spinal meningitis. In the following weeks, each member of the family deals with their grief in separate ways-- one brother hoping for a miracle, another turning to petty crime. Their mother, Claire, is wracked by guilt and finds herself unable to function, while their father, Ian, functions beautifully, never taking a step back from his role as the shepherd of his family and his ward. He must endure, especially when everyone else seems to be falling apart. 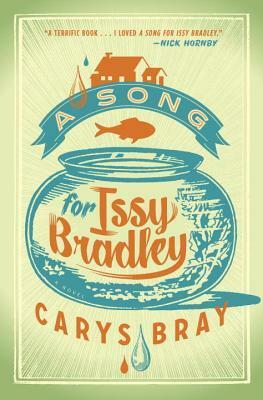 I feel pretty conflicted about A Song for Issy Bradley. The story is gripping, and Issy's death definitely hooks the reader into wanting to read more. Bray does a lovely job with the pacing, and I appreciated seeing multiple perspectives throughout the story. However, the adult Mormon characters, which the exception of Claire, all feel like caricatures. There's Ian, whose singular focus on living the letter of the law often results in completely ignoring the spirit of the law and making the people in his family resentful. The stake president, who isn't as ardent as Ian, comes off as a hypocrite. The members of the ward seem either needy or nuts. It's no wonder the family is in a state of spiritual crisis. These aren't the Mormons I know-- the Mormons I know, for the most part, are complicated and genuinely trying to do their best, but aren't nearly as inflexible as Bray presents them in the novel. While I really liked the story (and loved the ending), and strongly identified with Claire's character, ultimately I felt that Bray spent too much time grinding her ax to write with nuance in A Song for Issy Bradley. I felt exactly like you did on reading this--who are these Mormons that she is showing here? I don't recognize them. Then, I listened to her podcast on A Thoughtful Faith with Gina Colvin and realized that what a difference the international context makes in a Mormon congregation. She describes her father (if I remember correctly) as very similar to Ian. It helped me appreciate her perspective more, even if I didn't find it exactly the same as the wards I've experienced. Runner, reader, writer, mom to six, including two from China.